Ask fellow campers about "Meat Cove Campground" and nearby attractions. Price is in Canadian $. One comes here for the scenery, not the amenities. 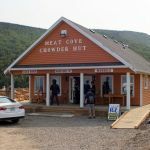 Meat Cove is located at the end of a part gravel, part paved road that follows the scenic coastline. The sites are in a grassy meadow on a bluff overlooking the ocean. Other than picnic tables and fire rings, there is no development. Sites are limited, and available on a 1st come basis so late arrivals will most likely have to turn around and hope for availability elsewhere. The sites are best suited for tents and small camping units. The view is unlike any other I've been to. The owner operates a small restaurant with tables inside and on a deck overlooking the water that is worthy of the trip out here if not camping. We camped at Meat Cove Campground in a Tent. The adjoining Chowder Hut serves an amazing fish chowder, the mussels and haddock were excellent. The small town of Capstick about 8km to the south has a co-op grocery and fuel. Meatcove was great. We had a rental 31', and were able to get to the campground fine. Zero issues. Philip had us at site #9, which was on one of the lower levels. Chowder Hut is great food. We did the quick hike to the north that overlooks the site. Whale watching in Bay St. Lawrence. Good beach. There was 7 of us for 2 days. Public shower and toilets not super great, but you're in the most remote are of Cape Breton. No complaints. Biggest thing though is getting there as early as possible to check in. Check out is 11, an there's only enough room for 3 or 4 RVs. First come first serve. We were there 3rd week of August. Got there around 10:30 and there was already two RVs ahead of me. We got last site. Not a ton of options if this didn't work out. When full, there isn't a lot of privacy. We camped at Meat Cove Campground in a Motorhome. Very, very friendly staff - was chatty and showed us all the sites personally! Wi-Fi available on all sites and is actually working pretty well (was usable for browsing and mail from inside camper). Toilets are bad and the hikes are not that well maintained (plants and trees are not cut, you have to duck often). This is of course understandable for such a small campground, but one can get surprised especially when having done hikes in the National Park before coming here. We camped at Meat Cove Campground in a Truck Camper. 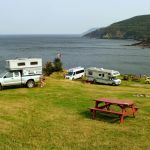 Dry camping on a spectacular cliff top cove at the tip of Cape Breton, perfect for whale watching. Sites are grassy, including fire pits w grills. They have flush toilets & (pay) hot showers in season (June 1-Sept 30), but allow free camping with pit toilets out of season. There are several nearby trails, one of which leads to a protected sandy beach. Meat Cove is 17.5 miles off the Cabot Trail at Cape North, of which <5 miles is 2 lane dirt road , well graded (at least while we were there), and the grades nothing compared to what you traverse on the Cabot Trail to get this far. There is one large level shelf that the manager said he had hosted a 57' rig the previous week, however with most sites hilly, and no dump station available (not to mention steep grades on Cabot Trail), is probably better suited to smaller rigs and tents. There is a small chowder hut on site, serving breakfast, lunch or dinner. Internet is available at the Meat Cove Tea Room -tourist info at the entrance to the village. I gave it a lower rating due to lack of sewer dump, however the friendly,helpful staff, peaceful & spectacular setting rate a 12! We camped at Meat Cove Campground in a Tent. Are you affiliated with Meat Cove Campground ?